First African American woman to receive the Master's degree in the Department of Sociology of the University of Chicago(June 1919). First African American woman offered a position by the Charity Organization Society of Chicago, Illinois. First African American woman appointed to the Chicago Public Schools, Board of Education (1958). 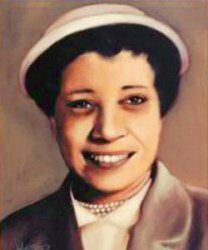 This pioneer served as the 2nd President of Alpha Kappa Alpha Sorority, Incorporated.